The number of older people being admitted to hospital with malnutrition has increased dramatically in the past five years. Catharine Sadler looks at what is being done to halt the rise and ensure that the nutritional needs of older people are being met. The sharp rise in the number of hospital admissions for malnutrition has caused concern among nurses and older people’s charities. Department of Health figures show the number of bed days occupied by patients with a primary or secondary diagnosis of malnutrition rose from 128,361 in 2010-11 to 184,528 in 2015-16 – a rise of 44% in five years. Four out of five of these patients were admitted as emergencies, and 42% were aged over 65. RCN professional lead for long-term conditions and end of life care Amanda Cheesley described the figures as ‘shocking’ but said the rise in admissions is due to a number of factors. She says social isolation and depression – triggered by transport difficulties, bereavement or family moving away – can contribute to poor eating habits in older people. Disabling conditions such as arthritis and appetite loss due to reduced taste and smell are also contributory factors. ‘As more older people, many with long-term conditions, struggle to manage independently at home, only those with high levels of need receive regular health or social care,’ says Ms Cheesley. ‘Consequently, preventive issues like nutritional monitoring and advice end up at the back of the queue until someone struggling with shopping, cooking or eating becomes an emergency themselves. ‘Malnourishment can lead to dehydration, falls, respiratory and urine infections and dry, paper-thin skin, causing pressure sores and poorly healing wounds after minor injury,’ she adds. A body mass index (BMI) of less than 18.5kg/m2. Unintentional weight loss greater than 10% in the past three to six months. A BMI of less than 20kg/m2 and unintentional weight loss greater than 5% in the past three to six months. NICE recommends that patients should be screened for malnutrition using a validated screening tool, such as the malnutrition universal screening tool (MUST). Developed by the British Association for Parenteral and Enteral Nutrition, this is now used widely by nurses in a variety of care settings. In 2012, the Malnutrition Task Force – an independent group of experts across health, social care and local government - was established to help tackle malnutrition in older people. According to the task force, which is managed by Age UK, around 1.3 million people in the UK aged 65 and over have malnutrition, and a third of people aged 65 and over are at risk of malnutrition on admission to hospital. In response to recommendations in the 2013 Francis report on poor care at Mid Staffordshire NHS Foundation Trust, the task force set up the Malnutrition Prevention Programme, funded by the Department of Health. The programme sees whole communities, including local NHS trusts, hospitals, GP practices and care homes, come together to try and reduce the number of people aged over 65 who are malnourished, and is based on five key principles (see box). This whole community approach is being piloted in five different areas across England: Gateshead, Salford, Purbeck in Dorset, Kent, and the London boroughs of Southwark and Lambeth. Malnutrition Task Force lead and former nurse Lesley Carter says: ‘Our pilots reveal that while most elderly people wish to remain independent, social isolation and disability, rather than poverty, explain their malnourishment. 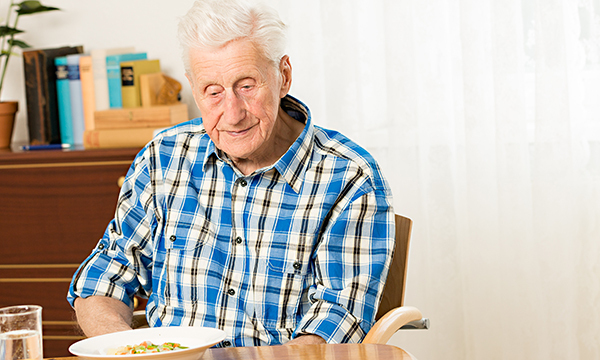 ‘Community nurses, and increasingly nutrition nurses, are identifying and alleviating malnutrition, but the time pressures on carers can prevent them from identifying older people’s eating problems. We are working with care commissioners to alleviate this. Elizabeth Alderton, district nurse and specialist community practice teacher in the Harold Hill district of north east London, is not surprised by the rise in emergency malnutrition cases. But Ms Alderton stresses that patients on her large caseload have a full nutritional assessment. Effective communication between members of Ms Alderton’s community team is key to delivering good nutritional care. ‘If our carers or nursing assistants suspect an older person is not eating well, we make an assessment visit,’ she says. As the health and social care system struggles to meet the needs of an aging population, nurses should view every contact with an older person as an opportunity for nutritional and health intervention. ‘Remaining mentally, socially and physically active into old age improves psychological well-being, appetite and health,’ says Ms Cheesley. Identify older people who are malnourished or at risk. Provide support, care and treatment and monitor progress. Monitor and evaluate your activities.